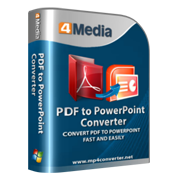 Convert PDF to PowerPoint presentations with all image, tables, hyperlinks and layouts retained. Allow you to load more than one PDF files and convert them with great quality. Convert certain range pages or all pages you specify. Support Microsoft 2010, 2007, and 2003.